This is the Kettle-Jitsu Revolution 8 week Kettlebell and body weight program and the Ulitmate Turkish Get Up one month kettlebell and body weight program combo package! More than 3 months of training! Including, mobility warm ups, abdominal workouts, body weight interval training (BIT), body weight flows and combos, Kettlebell interval training (KIT) and kettlebell circuit training (KCT)! 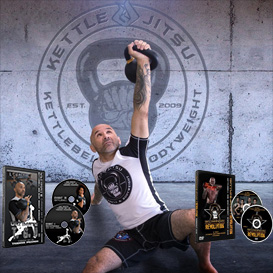 Also includes over 40 detailed intructional videos for each kettlebell and body weight technique! Save money and purchase now! !